After a string of delays and cancellations, the 2015 Stand Up World Series finally got started in Barcelona two weeks ago (June 27/28), with Connor Baxter and Candice Appleby proving too strong for the well assembled field of elite athletes. 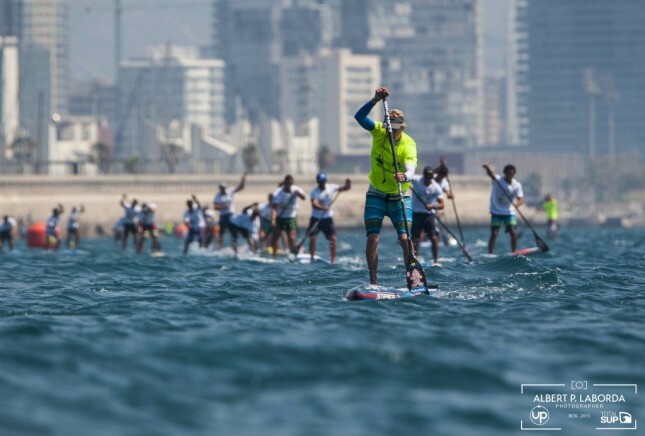 Despite a few false starts earlier in the year, the World Series seems to have pulled off a very solid race in Spain, with a well organised and well attended event, held in a landmark location, receiving thumbs up from many of the paddlers. At the very least it attracted a competitive field: The Barcelona World Series event earned a Race Index score of 39.5% (on the men’s side at least), which pegs it as the second most competitive race in all of Europe (behind only the Lost Mills, which sits at 43.5%) and the fourth most-competitive race of 2015 (behind Carolina, Lost Mills and the ISA distance race). The women’s field was considerably shallower, attracting just 20.0% on the Race Index. However that was still enough to qualify for the SUP Racer World Rankings, which includes all races that are worth 15.0% or more. The higher an event’s Race Index score, the more world ranking points on offer, which meant there were plenty up for grabs for the guys. Taking the lion’s share of those points was Connor Baxter, who won both the distance and sprint disciplines on his way to the overall event title. This continues Connor’s stellar form in Euro land, after he wrapped up the overall Euro Tour championship title a week earlier (the Barcelona event, despite being right in the middle of the Euro summer, chose not to be part of the Euro Tour this year because… paddletics). Finishing runner-up overall was Connor’s long-time sparring partner Kai Lenny, who hates to lose (especially to Connor) and will be hoping to get one back on his Maui rival at the uber prestigious Molokai 2 Oahu race later this month. But it wasn’t all bad news for Kai: His 2nd place finish was *just* enough to edge ahead of Danny Ching on the World Rankings, restoring the superstar to the world number two position that he lost 10 weeks ago. The elevation may be short-lived though: In a cruel twist, the cancellation of the World Series’ other big European event, the SUP World Cup in Germany, means Kai’s bounty of points from that event will expire on July 20th (events are only held in the system for 12 months), and that will likely drop him back down to world number three. Arthur Arutkin picked up a solid third place in Barcelona, extending his fantastic run of form in the European Summer of SUP and elevating him to #15 on the World Rankings Leaderboard. Italian champion and one of the new heroes of Europe, Leonard Nika, finished 4th overall. That result, along with a string of podiums on the Euro Tour, helped push Leo well inside the world’s top 20 ranked paddlers for the first time. On the women’s side it was Candice all the way, with the Californian holding off Angie Jackson from Australia and Euro whipper snapper Manca Notar from Slovenia. French number one Celine Guesdon was fourth, while rising Spanish talent Ane Zulaika rounded out the top five. Another fresh hope from Spain, Susak Molinero, who lives and trains in Italy with her boyfriend (and another new hero of Europe) Paolo Marconi, finished sixth in Barca. Just like Paolo, Susak rides for the Jimmy Lewis stable, though you wouldn’t know that from the official results sheet: In a decision I can only call bizarre, the Stand Up World Series won’t list which board you were riding unless your sponsor pays the Series organisers a marketing fee. As the women’s field was much shallower than the men’s, the Barcelona World Series unfortunately event had very little impact on the World Rankings – Women’s Top 50 Leaderboard. All in all looks like a great weekend at the beach in Barcelona. It wasn’t the biggest event in terms of participation numbers, but the local organising team, who seem very competent, may just have laid the foundation for a really big event next year. Either way it’s great to see another highly-competitive, international-level event in Euro land. Good sign for the future of the sport and all that. I wouldn’t quite call it “prestigious” like the World Series organisers did (you can’t manufacture prestige), but it still looked like a great start.